Idaho Is Trying To Make It Harder For Voters To Put Initiatives On The Ballot Lawmakers in Idaho and other states across the country are trying to make it more difficult for voters to get issues they care about onto the ballot. Voters say they feel silenced. 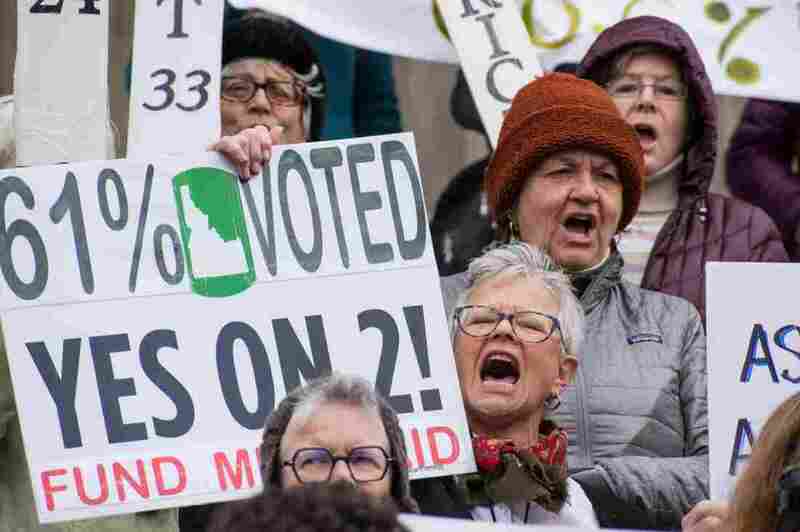 After voters in Idaho passed Medicaid expansion by 61 percent, some state lawmakers are trying to make the process for putting citizen-driven initiatives on the ballot more difficult. This week in Idaho, some voters are speaking out against a bill that would make it harder for citizens to get issues they care about on the ballot – anything from Medicaid expansion to marijuana. Twenty-six states allow for voter-driven initiatives but as that process becomes more popular, lawmakers from Maine to Utah and Idaho believe it's time to pull it back. In November, voters in Idaho passed Medicaid expansion by 61 percent. "I've always believed that if you don't like the way something is then you should do something about it," says Carol Richel, a third-generation Idahoan who, along with thousands of other volunteers, worked to get Medicaid expansion onto the ballot. If passed, the bill would make it more difficult for citizen-driven initiatives to be put to voters in the state by requiring nearly twice as many people to sign petitions in one-third of the time. Additionally, signatures would need to come from nearly every legislative district in a state which is more than 40 times the physical size of Delaware. Richel and others say Medicaid expansion wouldn't have been possible under the proposed law, sponsored by Republican Sen. Scott Grow. "I have to say, I was incredibly disappointed that he was wanting to take the voice of the people away," Richel says. Sen. Grow says he doesn't want Idaho to become a state like California, where there are at least several ballot propositions every two years. "This right to propose voter initiatives can be carried to an extreme, reducing the effectiveness and efficiency of state government," Grow says. But the hundreds of people who showed up for a public hearing earlier this week have said the bill is an attack on their Constitutional rights. Six members of the public were able to speak before Republican Sen. Patti Anne Lodge, the committee's chairwoman, tried to cut off a packed room from testifying. They eventually scheduled another hearing for Friday. Now Carol Richel is volunteering again. She and others are knocking on doors in Sen. Grow's suburban Boise district, trying to drum up a little backlash of their own. In other states, elected officials have completely repealed, or significantly undercut voter-enacted laws in recent years, according to Josh Altic who tracks initiatives for the website, Ballotpedia. In 2017, the South Dakota legislature swatted down a measure that broadened campaign finance reporting laws. Florida initially made it illegal to smoke medical marijuana after voters amended their constitution to legalize the drug. Altic says he's seeing these moves more frequently. "You'd think there'd be some sort of political consequences to overturning something that was approved at the ballot," he says. "I think we're still sort of waiting to see what that fallout could be." If the bill does pass in Idaho, voters could still try to repeal it. But they'd have to play by the new – and more restrictive – rules to get it on the ballot.